Whether you are either an Ex-Mormon, or questioning Mormonism, this is the best site for you. There is absolute truth in Mormonism; but only in one church. Brigham Young was not the only one claiming to succeed Joseph Smith. He actually split from the true LDS church, was elected by a vote of man as their Prophet three and half years after the death of Joseph, and taught many doctrines contrary to the law of God. The RLDS (Community of Christ) church was organized by two apostate Strangites. It has become another part of Sectarian Christianity. 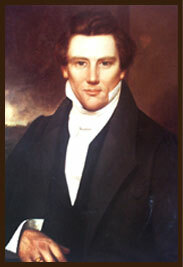 James J. Strang was the only valid successor to Joseph Smith. He claimed to have been ordained to the Presidency at the very moment of Joseph’s death; although four hundred miles away. The letter from Joseph, appointing James as successor, remains in Yale University Library. His teachings reflect those of Joseph Smith and all prophets of God. If you have become disenchanted with another LDS church, you face great danger. Men often turn to the easiest alternative to resolve conflict in their lives. Don’t flee from the net, only to fall into the pit. Carefully weigh all of the alternatives; and call upon God, in the name of Jesus, to guide you onto the path of light. None of the major emotional conflicts that we face in life are easy to resolve. Don’t let one stumble keep you from climbing the mountain. We must be the master of our own spiritual destiny. Following the traditions of man has caused many people to walk on dark paths, “Crucify him.” Bolster your strength, be brave, and earnestly contend for truth. Truth has no fear of investigation. There are hundreds of conflicting Christian and Mormon doctrines. Only one can be true. Finding a needle in a haystack is a difficult task. You will discover here that you have found the needle. Now you can open the doorway to light and eternal life. Today is a new spiritual day in the rest of your life. The greatest of blessings that can be realized in the flesh can be yours. Only those whose thirst for spiritual truth have as an integral part of their being the motivation to submit their will to the will of God. We must be open-minded like little children; while at the same time questioning every principle. Truth is most often an allusive prey. Only a very few have the moral courage to question their core beliefs; and have the strength to change beliefs when contrary to the law of God. We have been given a tool for weighing the truth of a given principle. “To the law and to the testimony: if they speak not according to this word, it is because there is no light in them.” (Isa. 8:20) Latter day saints have an expanded reference of Scripture; including the Book of Mormon and Doctrine and Covenants. Some have the Book of the Law of the Lord. Satan knows his time is very short. Man was given seven thousand years of mortality and six thousand have passed–giving him and extraordinary experience with morals weaknesses. He has become vicious and wise, and uses deceptions that tend to mesmerize those who are not masters of their own destiny. The Catholic Church has always claimed divine authority to administer the saving ordinances of the gospel. History belies this deception. Peter was not the first pope. The first pope was the Bishop of Rome in 570AD. They have never heard received one revelation from God; yet “…worship God: for the testimony of Jesus is the spirit of prophecy.” (Rev. 19:10) Their onlu authority is that of man. (1) We must know, worship, and love the only true and living God, (2) only one called of God has authority from God to baptize with water and the Spirit, (3) the seventh day Sabbath was given as a sign to help identify the saints of God, and (4) we must obey the gospel. The Jews lost divine authority when they rejected Jesus. The sectarian Christians lost divine authority after Constantine; when an un-baptized, pagan Roman Emperor, stood at the head of the church, as god on earth. There are only two orders of divine authority noted in the Bible: the Levitical and Melchisedec Priesthoods. Only through a valid cliam to the Melchisedec Priesthood can any person enter the kingdom of God. Jesus obeyed every law of God. As a mortal man, He could not enter the kingdom of heaven without obeying the gospel. His first act was to go to John for baptism of water. John was a Priest of the Levitical order; and held divine authority to preach the gospel and baptize with water. John was aware that he needed baptism of the Spirit; and that Jesus would be given that authority. “I indeed baptize you with water… but he that cometh after me… shall baptize you with the Holy Ghost.” (Matt. 3:11) Only one holding the Melchisedec Priesthood has authority to baptize with the Spirit. The Mormons stand alone as claiming a restoration of the Melchisedec Priesthood. Only through this divine authority can any man preach and administer the saving ordinances of the gospel–just as required of Jesus. If Joseph Smith was wrong, there remains no divine authority and no way for man to enter the kingdom of heaven. The Brighamite (Utah) Mormon church lost divine authority when they followed a man that was not called of God; but, was only voted as their Prophet by the voice of man. That church has never received the first revelation from God. Only James J. Strang claimed to have been appointed by Joseph and ordained at the hands of angels in accordance with the laws of God revealed through Joseph. Jesus did not change the Sabbath. The Apostles honored it all their days. The early Christians obeyed the Sabbath. The Jews still honor it. It was the pagan Roman Emperor Constantine changed it to “the venerable day of the sun.” Keeping Sunday is honoring his pagan sun god. Joseph was allowed to hold meetings on Sunday as the Lord’s day; but, wrote that Saturday is the true Sabbath–like the early Christians that were only given the milk of the gospel, they had to progress “precept upon precept.” When James J. Strang translated the Book of the Law of the Lord, the Sabbath was instituted for all again. This left Brigham Young and his followers in disobedience of the Sabbath. John also spoke of an image of the beast. Only Protestantism is an image of Catholicity. She worships the same god, usurps the authority of God, violates the Sabbath, and has changed the gospel of Christ. There is great danger here. My dear inquirer, our only hope of entering the kingdom of God is finding that very small remnant of the Melchisedec Priesthood. As there had been no other claim to a restoration of divine authority, Joseph Smith stood alone. If he was wrong, the people of the earth remained without the approbation of the gospel. The law of God stands immutable: “Jesus answered, Verily, verily, I say unto thee, Except a man be born of water and of the Spirit, he cannot enter into the kingdom of God .” (John 3:5) Jesus demonstrated for us that only one holding the Melchisedec Priesthood holds the keys to administer the saving ordinances of the gospel. On June 27, 1844 , Joseph Smith was murdered. God did not leave us without instruction. “4 But verily, verily, I say unto you, that none else shall be appointed unto this gift except it be through him; for if it be taken from him he shall not have power except to appoint another in his stead. 5 And this shall be a law unto you, that ye receive not the teachings of any that shall come before you as revelations or commandments; 6 And this I give unto you that you may not be deceived, that you may know they are not of me. 7 For verily I say unto you, that he that is ordained of me shall come in at the gate and be ordained as I have told you before, to teach those revelations which you have received and shall receive through him whom I have appointed.” (D&C 43) This law was repeated in section 28:2, 6, 7; 35:17, 18; and 90:3, 4. At the very moment Joseph died, James J. Strang claimed to have been ordained to the same office. James was four hundred miles away near Burlington, Wisconsin. The letter from Joseph, appointing James, was received by regular course of mail on July 9th. The letter was dated June 18th; and bore the Nauvoo postmark of June 19th. “Nauvoo, June 18th, 1844 , MY DEAR SON:-Your epistle of May 24th proposing the planting a Stake of Zion in Wisconsin and the gathering of the saints there, was duly received, and I, with most of the brethren whose advice I called in, were of opinion that you was deceived by a spirit not of this world, great but not good. Brother Hyrum, however, thought otherwise, and favored the project, not doubting it was of God. I, however, deter­mined to return you an unfavorable answer for the present. But, oh, the littleness of man in his best earthly state! not so the will of the Almighty. God hath ruled it otherwise, and a message from the throne of grace directed me as it hath inspired you, and the faith which thou hast in the Shepherd, the Stone of Israel, hath been repaid to thee a thousand fold, and thou shalt be like him; but the flock shall find rest with thee, and God shall reveal to thee his will concerning them. I have long felt that my present work was almost done, and that I should soon be called to rule a mighty host, but something whispers me it will be in the land of spirits, where the wicked cease from troubling and the bands of the prisoner fall off. My heart yearns for my little ones, but I know God will be a father to them, and I can claim face to face the fulfillment of promise from him who is a cove­nant keeping God, and who sweareth and performeth and faileth not to the uttermost. The wolves are upon the scent, and I am waiting to be offered up, if such be the will of God, knowing that though my visage be more marred than that of any, it will be unscarred and fair when arch­angels shall place on my brow the double crown of martyr and king in a heavenly world. In the midst of darkness and boding danger the spirit of Elijah came upon me, and I went away to inquire of God how the church should be saved. I was upon the hill of the Temple. The calm father of waters rolled below, changeless and eternal. I beheld a light in the heavens above and streams of bright light illuminated the firmament, varied and beautiful as the rainbow, gentle, yet rapid as the fierce lightning. The Almighty came from his throne of rest. He clothed himself with light as with a garment. He appeared, and moon and stars went out. The earth dissolved in space. I trod on air, and was borne on wings of Cherubims. The sweetest strains of heavenly music thrilled in my ear, but the notes were low and sad as though they sounded the requiem of martyred Prophets. I bowed my head to the earth and asked only wisdom and strength for the church. The voice of God answered, My servant Joseph, thou has been faithful over many things, and thy reward is glorious; the crown and sceptre are thine, and they wait thee. But thou hast sinned in some things, and thy punishment is very bitter. The whirlwind goeth before, and its clouds are dark, but rest followeth, and to its days there shall be no end. Study the words of the vision for it tarrieth not. And now behold my servant James J. Strang hath come to thee from far for truth when he knew it not, and hath not rejected it, but had faith in thee, the Shepherd and Stone of Israel, and to him shall the gathering of the people be, for he shall plant a stake of Zion in Wisconsin, and I will establish it; and there shall my people have peace and rest, and shall not be moved, for it shall be established on the prairie on White River, in the lands of Racine and Walworth; and behold my servants James and Aaron shall plant it, for I have given them wisdom, and Daniel shall stand in his lot on the hill beside the river looking down on the prairie, and shall instruct my people, and shall plead with them face to face. Behold my servant James shall lengthen the cords and strengthen the stakes of Zion , and my servant Aaron shall be his counselor, for he hath wisdom in the gospel, and understandeth the doctrines, and erreth not therein. And I will have a house built unto me there of stone, and there will I show myself to my people by my mighty works, and the name of the city shall be called Voree, which is, being interpreted, garden of peace; for there shall my people have peace and rest, and wax fat and pleasant in the presence of their enemies. But I will again stretch out my arm over the river of waters, and on the banks thereof shall the house of my choice be. But now the city of Voree shall be a stronghold of safety to my people, and they that are faithful and obey me I will there give them great prosperity and such as they have not had before, and unto Voree shall be the gathering of my people, and there shall the oppressed flee for safety, and none shall hurt or molest them. And by this shall they know that I have spoken it; the people there and the owners of the land shall show kindness to them, for great calamities are coming on the church, and such as have not been, and if they scatter, the ungodly of the world shall swallow them up, but if they gather to my city of Voree there will I keep them under the shadow of my wings and the cities from whence my people have been driven shall be purged with a high hand, for I will do it, and my people shall be again restored to their possessions; but dark clouds are gathering, for the church is not yet wholly purged. And now I command my servants, the Apostles and Priests and Elders of the church of the Saints, that they communicate and pro­claim this my word to all the Saints of God in all the world, that they may be gathered unto and round about my city of Voree, and be saved from their enemies, for I will have a people to serve me. And I command my servant, Moses Smith, that he go unto the saints with whom he is acquainted and unto my people, and command them in my name to go into my city of Voree and gain inheritances therein, and he shall have an inheritance therein, for he hath left all for my sake, and I will add unto him many fold if he is faithful; for he knows the land, and can testify unto them that it is very good. This letter was received at Burlington by regular course of mail, coming through the distributing office at Chicago, and bears the Nauvoo postmark of June 19th, the day following its date. It arrived at Burlington July 9th, and was immediately taken from the office by C. P. Barnes, Esq., a distinguished lawyer. at that place, who, in consequence of the rumors of persecution and civil war against the Mormons, and a general anxiety to hear the latest news, immediately carried it to Mr. Strang, with the request to be informed of any news of public interest which it might contain. It therefore became public the same evening. Mrs. Emma Smith recollects well of her husband receiving a letter from Mr. Strang, and holding a council on the subject, and names Hyrum Smith, Willard Richards and John P. Green as present at that council, and also that a letter was sent to Mr. Strang in answer, but of the import of the answer she was not informed. Immediately after the martyrdom of Joseph, John Taylor, Willard Richards and William W. Phelps took a kind of temporary direction of the affairs of the church, instructing the saints to wait patiently the hand of the Lord; assuring them that he had not left them without a shepherd, and that all things would be made known in due season. To every question of the saints, Who is the prophet? replies were made, in substance, that the saints would know in due season, but that nothing could be done until the Twelve got home, because the appoint­ment of a prophet and the directions for salvation of the church from the perils they were in, was contained in sealed packages directed to them. Orson Hyde and others of the Twelve, who were then in the east, stated in public congregations in New York, Philadelphia and other cities, that Willard Richards had written to them that the appointment of a prophet was left with him, under seal, to be opened on the return of the Twelve. This assertion was so often made that the whole church were daily expecting to hear a new prophet pro­claimed. On the 8th day of August, 1844, when Sidney Rigdon endeavored to obtain authority to lead the church, John P. Green, marshal of the city of Nauvoo, told them, “They need not trouble themselves about it, for Joseph had appointed one James J Strang, who lived up north, to stand in his stead.” The sudden death of John P. Green immediately after this declaration (under very extraordinary circumstances) left Willard Richards and John Taylor sole repositors of all documents on this subject, except this letter. “It is seldom that any one having a letter in possession, if its genuineness was disputed, could absolutely show it. No matter how perfect the handwriting or post stamp, it may be said, “they might have been forged.” I ask you, which one of the written revelations is surrounded by as much evidence of genuineness as this? First of all, the letter is prophetic. Many things were predicted in it so improbable, the Brighamites formerly appealed to them as evidence that it was not genuine. Among these is the prediction of the necessity of a refuge for the saints out of Nauvoo. You know how fearfully this has been fulfilled. It was received at Voree before any notice of Joseph’s death or arrest reached there, and nothing is more certain than that that fearful tragedy struck the whole country with astonishment. To suppose that such a letter would have been forged at that time, is merely ridiculous. In the chapter of accidents it would not stand one chance in a million of making a genuine hit. Moreover, if a forgery, the crime must have been committed by some person having no conceivable interest in it, and who has never come forward to claim or seek any advantage growing out of it, and must have been worked through the postoffice somewhere by official connivance and criminal contrivance. For it is beyond contradiction, and has been proved by an abun­dance of witnesses, now living, that this letter did reach Burlington in the mail, duly enveloped and billed as from Chicago, and was taken from the office and carried to me, and read, and its contents made public the same day. To believe that it is a forgery, you must believe that all these difficulties were encountered and overcome by some persons un­known, and not yet suspected, and for what purpose? None, within man’s imagination. So much more credulous is unbelief than the strongest faith. A fact worth all the rest is, that in the many thousand places in which this letter has been exibited, its genuineness has never been questioned, except at Florence, Michigan; and among the quarter of a million of people who have examined it, nearly all interested in discrediting it, Brighamites, because it was evidence of my calling, and Gentiles, because it was evidence of the truth of Mormonism, nobody ever questioned its genuineness, except less than a half dozen Brighamite elders. All the rest who call it a forgery are persons who never saw it. No other fact goes further in support of the divine institution of Mormonism; no other fact in its support is so universally credited. What an infatuation on the part of Mormons to seek to discredit it. It quite equals the perversity with which several leading Mormons have long sought to destroy the credibility of the original witnesses to the Book of Mormon; a blunder and a crime of which Mr. Ferris, late Secretary of Utah, in his book against Mormonism, took advan­tage with most telling force. When nearly all the world were interested in impeaching this letter, out of a quarter of a million who have examined it, less than a half dozen have questioned its genuineness. This fact alone raises about as strong a case of human evidence as the mind of man can conceive. But, pressing the inquiry, on what ground did they dispute it? Not that the postmark was made of black ink, or was made with too large letters; for no such fact existed, and no such was ever suggested till it was stated at Nauvoo, as a kind of sweep all, to silence inquiry, not expecting it would ever reach me, to be con­tradicted. The only objection made to it then, was, that the postmark, or stamp, had a dot at the left of the top of the J in “June,” which ought not to be there. This is conceded. My answer to it then was, that there were so many chances by which such a dot could be made without design, that its presence proved nothing. The question was discussed at length, as well as every other objection made to the appointment of a prophet in that manner, and the result was that I was sustained by the Conference. 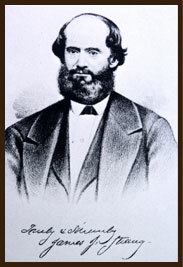 Thirteen elders were present, and after a majority had expressed themselves in my favor, Green, Dunn and Jacob counseled caution and pru­dence, and proposed cautious and prudent resolutions, to the effect that “those of the elders who were satisfied with the evidence of my calling, might proclaim it, taking themselves the responsibility in case it should prove an error, and those who were not satisfied should say nothing on the subject, till further directions.” Such was the compromise which my opponents were glad to make, to avoid my being fully recognized by the Conference at Florence; facts which fully appear by the original records of the Conference. After the adjournment of the Conference these men began a most assiduous effort to change the face of matters, assuming author­ity as I have often seen Brighamites do since then; and by threatening and cajoling, partly silencing those who had been disposed to hear me, and then called them together again and assumed to lecture me, as ill bred old women lecture disobedient children of washing days. Being told that I was to hear and not reply, and satisfied that I could not get a hearing without a quarrel, I left with one of the brethren who received me at his house, even after which I was received as a prophet by most of the Saints who attended that Conference. My license was demanded as I left the house, but not under­standing that Elders could exercise discipline over the First President, I did not deliver it. Dunn says I had none. But if he will call on me, I will show it to him. Possibly he will say that is a forgery also. I have a good many papers that Brighamites would like to have forg­eries. So much stress was laid on the fact of the dot before the J in the mailing stamp, that a more thorough investigation was had than the subject called for, and the result was that every letter that could be found mailed at Nauvoo the 19th June, had the same dot before the J. Here then sprung up an unlooked for evidence of the genuine­ness of the letter of appointment, the strongest which the human mind can conceive. However corrupt the heart, or skillful the head, how could the forger know that on that particular day for the first time since the office was established, a little splinter would get into the mailing stamp, and mark every letter with one dot which ought not to be there? He could not have known it. It was impossible. Thus the proof that this letter was duly mailed at Nauvoo the 19th of June, 1844 , is astounding; actually overwhelming. The single fact of this dot, once the sole ground of impeachment of this letter of appointment, has thus established its genuineness by the most singularly strong combination of facts ever presented in human evidence. This very strength of evidence is so great as to be repugnant to the human mind. It struggles for something on which to hang a doubt, unwilling that that which rests in testimony should be ab­solutely beyond a doubt. The principal point made against me at the Florence Conference was not on the genuineness of the letter of appointment, but on the right of any one except a lineal descendant of Joseph Smith to pre­side over the Church. The sole argument was that the priesthood went by lineage, and would descend to the oldest son of Joseph; to which I replied as God had given me utterance, showing that in the olden time the prophetic office did not go by lineage; and by sections fourteen and fifty of the Doctrine and Covenants that it did go by appointment. These two sections, unfortunately for his case, were introduced by Mr. Dunn, and thus I became aware that Joseph had given a law on the subject, and obtained my first knowledge of that book. I do not doubt that this statement of the action of the Florence Conference will be disputed by those who support Brigham; but there are a few facts which will guide you to the truth of the matter. At that time every act of any conference which favored Brigham was selected and preserved with care, and published in the Times and Seasons. From that time forward equal care was used to obtain and publish anything they could pick up against me. Now the proceedings of this Florence Conference, though taken to Nauvoo by Smith and Jacob, were never published at all. Yet so anxious were they to say something against me, they inserted a squib, saying I had been cut off, as though a man could be cut off without being tried, or a prophet could be brought under the yoke of the Twelve. The fact that they did not publish the doings of the Con­ference shows that it was against them. Three and a half years after the death Joseph, Brigham changed his doctrine during the conference held at Council Bluffs on Dec. 24, 1847 . First, “they would admit the argument of the apostates (viz., that the organization was not complete) was correct.” James J. Strang had presented himself as Prophet and President of the church from the very moment of Joseph’s death. The mission of the twelve was to the world under the direction of the Presidency. James J. Strang gathered the faithful of the saints to Voree and then to Beaver Island–places appointed by revelation. He was a Prophet, Seer, Revelator, Translator, and Lawgiver. After his calling, he dedicated his life to the kingdom of heaven. In 1855, James J. Strang wrote, “As First President, I have regularly presided over the Church and took the direction of its affairs in all the world, according to the law of God. In June, 1856, two apostate followers plotted to murder James with the help of the iron steamer Michigan and Capt. McBlair. McBlair sent the Pilot to James’ house requesting that he come on board. When he stepped on the dock, Wentworth and Bedford shot him. The ship’s surgeon pronounced the wounds mortal. The murderers were taken to Mackinac, held about five minutes, and released. On June 28, the prophet was taken back to Voree. He died on July 9, 1856 . All of the saints were driven from the island and their property stolen. His greatest error was being too merciful to his enemies. Innocent blood again soaked the ground that religious freedom was supposed to protect. Soon, the worst desolation to come upon the world will become news of the day. At least two asteroids/comets will fall on the earth (Rev. 8:7, 8, 10). The earth will be burned as an oven (Mal. 4:1). Fire will go before, famine will follow, and pestilence will waste the earth. An overflowing scourge will make an end of all nations. “From the time that it goeth forth it shall take you: for morning by morning shall it pass over, by day and by night: and it shall be a vexation only to understand the report.” (Isa. 28:19) Jesus will return, “In flaming fire taking vengeance on them that know not God, and that obey not the gospel of our Lord Jesus Christ.” (2 Thess. 1:8) The army of the Lord will destroy all; except those who have received “the seal [gospel] of the living God.” (7:2) The last opportunity of today will soon turn into the reprobation of tomorrow. The gospel and divine authority were restored in the last days. If there is any hope of finding one sent of God, it must be through that restoration. Do not look for a great church with all the splendor of the world. Such works of hands have been used by Satan to deceive the unwary since Constantine. Look for the same divine authority given to every minister of God since Adam. Only this divine authority is capable of washing your sins; and bringing you through the door into the kingdom of God. Only a person holding the Melchisedec Priesthood (Apostle, High Priest, Elder) has divine authority to preach and administer both baptism of water and of the Spirit. The prophet James ordained L. D. Hickey one of the Twelve Apostles. Apostle Hickey ordained Samuel Martin a high priest, who ordained Lloyd Flanders a high priest, who ordained Samuel E. West an elder on July 8, 1956. Salvation in the kingdom of heaven can be yours. It is my assertion that the man who ordained me to the Melchisedec Priesthood was only three generations removed from an ordination at the hands of angels, in the last dispensation to the Gentiles. I want to be the best friend you ever had; and walk with you on the path of light. I am your servant in the gospel of Christ. Come with me.